Current anthropogenic CO2 emissions from stationary sources come mostly from combustion systems such as power plants, cement kilns, furnaces in industries and iron and steel production plants (see Chapter 2). In these large-scale processes, the direct firing of fuel with air in a combustion chamber has been (for centuries, as it is today) the most economic technology to extract and use the energy contained in the fuel. Therefore, the strategic importance of post-combustion capture systems becomes evident when confronted with the reality of today's sources of CO2 emissions. Chapter 2 shows that any attempt to mitigate CO2 emissions from stationary sources on a relevant scale using CO2 capture and storage, will have to address CO2 capture from combustion systems. All the CO2 capture systems described in this section are aimed at the separation of CO2 from the flue gases generated in a large-scale combustion process fired with fossil fuels. Similar capture systems can also be applied to biomass fired combustion processes that tend to be used on a much smaller scale compared to those for fossil fuels. Flue gases or stack gases found in combustion systems are usually at atmospheric pressure. Because of the low pressure, the large presence of nitrogen from air and the large scale of the units, huge flows of gases are generated, the largest example of which may be the stack emissions coming from a natural gas combined cycle power plant having a maximum capacity of around 5 million normal m3 h-1. CO2 contents of flue gases vary depending on the type of fuel used (between 3% for a natural gas combined cycle to less than 15% by volume for a coal-fired combustion plant See Table 2.1). In principle post-combustion capture systems can be applied to flue gases produced from the combustion of any type of fuel. However, the impurities in the fuel are very important for the design and costing of the complete plant (Rao and Rubin, 2002). Flue gases coming from coal combustion will contain not only CO2, N2, O2 and H2O, but also air pollutants such as SOx, NOx, particulates, HCl, HF, mercury, other metals and other trace organic and inorganic contaminants. Figure 3.3 shows a general schematic of a coal-fired power plant in which additional unit operations are deployed to remove the air pollutants prior to CO2 capture in an absorption-based process. Although capture of CO2 in these flue gases is in principle more problematic and energy intensive than from other gas streams, commercial experience is available at a sufficiently large scale (see Section 3.3.2) to provide the basis for cost estimates for post-combustion CO2 capture systems (see Section 3.7). Also, a large R&D effort is being undertaken worldwide to develop more efficient and lower cost post-combustion systems (see Section 3.3.3), following all possible approaches for the CO2 separation step (using sorbents, membranes or cryogenics; see Section 3.1.3). There are several commercially available process technologies which can in principle be used for CO2 capture from flue gases. However, comparative assessment studies (Hendriks, 1994; Riemer and Ormerod, 1995; IEA GHG, 2000b) have shown that absorption processes based on chemical solvents are currently the preferred option for post-combustion CO2 capture. At this point in time, they offer high capture efficiency and selectivity, and the lowest energy use and costs when compared with other existing post-combustion capture processes. Absorption processes have reached the commercial stage of operation for post-combustion CO2 capture systems, albeit not on the scale required for power plant flue gases. Therefore, the following paragraphs are devoted to a review of existing knowledge of the technology and the key technical and environmental issues relevant to the application of this currently leading commercial option for CO2 capture. The fundamentals of the CO2 separation step using commercial chemical absorption processes are discussed first. The requirements of flue gas pretreatment (removal of pollutants other than CO2) and the energy requirements for regeneration of the chemical solvent follow. Figure 3.3 Schematic of a pulverized coal-fired power plant with an amine-based CO2 capture system and other emission controls. Absorption processes in post-combustion capture make use of the reversible nature of the chemical reaction of an aqueous alkaline solvent, usually an amine, with an acid or sour gas. 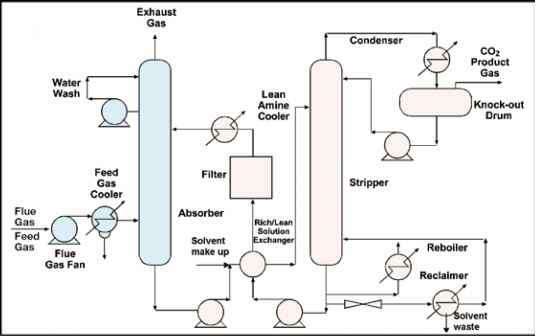 The process flow diagram of a commercial absorption system is presented in Figure 3.4. After cooling the flue gas, it is brought into contact with the solvent in the absorber. A blower is required to overcome the pressure drop through the absorber. At absorber temperatures typically between 40 and 60oC, CO2 is bound by the chemical solvent in the absorber. The flue gas then undergoes a water wash section to balance water in the system and to remove any solvent droplets or solvent vapour carried over, and then it leaves the absorber. It is possible to reduce CO2 concentration in the exit gas down to very low values, as a result of the chemical reaction in the solvent, but lower exit concentrations tend to increase the height of the absorption vessel. The 'rich' solvent, which contains the chemically bound CO2 is then pumped to the top of a stripper (or regeneration vessel), via a heat exchanger. The regeneration of the chemical solvent is carried out in the stripper at elevated temperatures (100oC-140oC) and pressures not very much higher than atmospheric pressure. Heat is supplied to the reboiler to maintain the regeneration conditions. This leads to a thermal energy penalty as a result of heating up the solvent, providing the required desorption heat for removing the chemically bound CO2 and for steam production which acts as a stripping gas. Steam is recovered in the condenser and fed back to the stripper, whereas the CO2 product gas leaves the stripper. The 'lean' solvent, containing far less CO2 is then pumped back to the absorber via the lean-rich heat exchanger and a cooler to bring it down to the absorber temperature level. Figure 3.4 also shows some additional equipment needed to maintain the solution quality as a result of the formation of degradation products, corrosion products and the presence of particles. This is generally done using filters, carbon beds and a thermally operated reclaimer. Control of degradation and corrosion has in fact been an important aspect in the development of absorption processes over the past few decades. • Flue gas flow rate - The flue gas flow rate will determine the size of the absorber and the absorber represents a sizeable contribution to the overall cost. • CO2 content in flue gas - Since flue gas is usually at atmospheric pressure, the partial pressure of CO2 will be as low as 3-15 kPa. Under these low CO2 partial pressure conditions, aqueous amines (chemical solvents) are the most suitable absorption solvents (Kohl and Nielsen, 1997). • CO2 removal - In practice, typical CO2 recoveries are between 80% and 95%. The exact recovery choice is an economic trade-off, a higher recovery will lead to a taller absorption column, higher energy penalties and hence increased costs. • Solvent flow rate - The solvent flow rate will determine the size of most equipment apart from the absorber. For a given solvent, the flow rate will be fixed by the previous parameters and also the chosen CO2 concentrations within the lean and the rich solutions. • Energy requirement - The energy consumption of the process is the sum of the thermal energy needed to regenerate the solvents and the electrical energy required to operate liquid pumps and the flue gas blower or fan. Energy is also required to compress the CO2 recovered to the final pressure required for transport and storage. 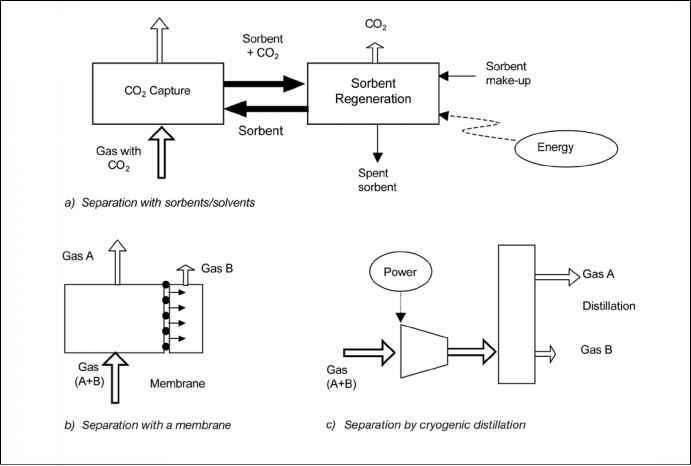 Figure 3.4 Process flow diagram for CO2 recovery from flue gas by chemical absorption. • Cooling requirement - Cooling is needed to bring the flue gas and solvent temperatures down to temperature levels required for efficient absorption of CO2. Also, the product from the stripper will require cooling to recover steam from the stripping process. A further CO2 purification step makes it possible to bring the CO2-quality up to food-grade standard. This is required for use in beverages and packaging. Since combustion flue gases are generally at atmospheric pressure and the CO2 is diluted, the CO2 partial pressure is very low. Also, flue gas contains oxygen and other impurities; therefore an important characteristic of an absorption process is in the proper choice of solvent for the given process duty. High CO2 loading and low heat of desorption energy are essential for atmospheric flue gas CO2 recovery. The solvents must also have low byproduct formation and low decomposition rates, to maintain solvent performance and to limit the amount of waste materials produced. The important effect of other contaminants on the solvent is discussed in Section 3.3.2.2. 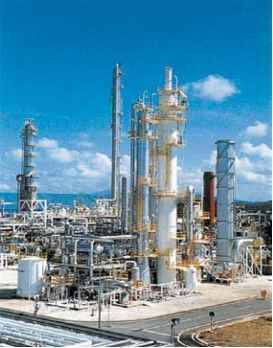 Figure 3.5 CO2 capture plant in Malaysia using a 200 tonne d 1 KEPCO/MHI chemical solvent process (Courtesy of Mitsubishi). coal-fired boilers, delivering CO2 for soda ash and liquid CO2 preparations. It uses a 15-20% by weight aqueous MEA (Mono-Ethanolamine) solution. The largest capacity experienced for this process is 800 tCO2 d-1utilizing two parallel trains (Arnold et al., 1982). • The Fluor Daniel ® ECONAMINE™ Process (Sander and Mariz, 1992, Chapel et al., 1999) - This process was acquired by Fluor Daniel Inc. from Dow Chemical Company in 1989. It is a MEA-based process (30% by weight aqueous solution) with an inhibitor to resist carbon steel corrosion and is specifically tailored for oxygen-containing gas streams. It has been used in many plants worldwide recovering up to 320 tCO2 d-1 in a single train for use in beverage and urea production. The performance of the chemical solvent in the operation is maintained by replacement, filtering and reclaiming, which leads to a consumables requirement. Typical values for the solvent consumption are between 0.2 and 1.6 kg/tCO2. In addition, chemicals are needed to reclaim the amine from the heat stable salt (typically 0.03-0.13 kg NaOH/tCO2) and to remove decomposition products (typically 0.03-0.06 kg activated carbon/tCO2). The ranges are primarily dependent on the absorption process, with KS-1 being at the low end of the range and ECONAMINE ™ at the high end. Flue gases from a combustion power plant are usually above 100°C, which means that they need to be cooled down to the temperature levels required for the absorption process. This can be done in a cooler with direct water contact, which also acts as a flue gas wash with additional removal of fine particulates. recovery becomes essential. For NOx it is the NO2 which leads to the formation of heat stable salts. Fortunately, the level of NO2 is mostly less than 10% of the overall NOx content in a flue gas (Chapel et al., 1999). " The allowable SOx content in the flue gas is primarily determined by the cost of the solvent - as this is consumed by reaction with SOx. SO2 concentrations in the flue gas are typically around 300-5000 ppm. Commercially available SO2-removal plants will remove up to 98-99%. Amines are relatively cheap chemicals, but even cheap solvents like MEA (with a price around 1.25 US$ kg-1 (Rao and Rubin, 2002) may require SOx concentrations of around 10 ppm, to keep solvent consumption (around 1.6 kg of MEA/tCO2 separated) and make up costs at reasonable values, which often means that additional flue gas desulphurization is needed. The optimal SO2 content, before the CO2 absorption process is a cost trade-off between CO2-solvent consumption and SO2-removal costs. For the Kerr-Mcgee/ABB Lummus Crest Technology, SO2-removal is typically not justified for SO2 levels below 50 ppm (Barchas and Davis, 1992). For the Fluor Daniel Econamine FG process a maximum of 10 ppm SO2 content is generally set as the feed gas specification (Sander and Mariz, 1992). This can be met by using alkaline salt solutions in a spray scrubber (Chapel et al., 1999). A SO2 scrubber might also double as a direct contact cooler to cool down the flue gas. Careful attention must also be paid to fly ash and soot present in the flue gas, as they might plug the absorber if contaminants levels are too high. Often the requirements of other flue gas treatment are such that precautions have already been taken. In the case of CO2 recovery from a coal-fired boiler flue gas, the plant typically has to be equipped with a DeNOx unit, an electrostatic precipitator or a bag house filter and a DeSO or flue gas desulphurization unit as part of the environmental protection of the power plant facilities. In some cases, these environmental protection facilities are not enough to carry out deep SO removal up to the 1-2 ppm level sometimes needed to minimize solvent consumption and its reclamation from sticking of solvent wastes on reclaimer tube surfaces. 3.3.2.3 Power generation efficiency penalty in CO2 capture A key feature of post-combustion CO2 capture processes based on absorption is the high energy requirement and the resulting efficiency penalty on power cycles. This is primarily due to the heat necessary to regenerate the solvent, steam use for stripping and to a lesser extent the electricity required for liquid pumping, the flue gas fan and finally compression of the CO2 product. Later in this chapter, Sections 3.6 and 3.7 present summaries of CO2 capture energy requirements for a variety of power systems and discuss the environmental and economic implications of these energy demands. In principle, the thermal energy for the regeneration process can be supplied by an auxiliary boiler in a retrofit situation. Most studies, however, focus on an overall process in which the absorption process is integrated into the power plant. The heat requirement is at such levels that low-pressure steam, for example condensing at 0.3 MPa(g), can be used in the reboiler. The steam required for the regeneration process is then extracted from the steam cycle in the power plant. For a coal-fired power station, low-pressure steam will be extracted prior to the last expansion stage of the steam turbine. For a natural gas fired combined cycle, low-pressure steam will be extracted from the last stage in the heat recovery steam generator. Some of this heat can be recovered by preheating the boiler feed water (Hendriks, 1994). Values for the heat requirement for the leading absorption technologies are between 2.7 and 3.3 GJ/ tCO2, depending on the solvent process. Typical values for the electricity requirement are between 0.06 and 0.11 GJ/tCO2 for post-combustion capture in coal- fired power plants and 0.21 and 0.33 GJ/tCO2 for post-combustion capture in natural gas fired combined cycles. Compression of the CO2 to 110 bar will require around 0.4 GJ/tCO2 (IEA GHG, 2004). Integration of the absorption process with an existing power plant will require modifications of the low-pressure part of the steam cycle, as a sizeable fraction of the steam will be extracted and hence will not be available to produce power (Nsakala et al, 2001, Mimura et al.,1995, Mimura et al., 1997). To limit the required modifications, small back-pressure steam turbines using medium pressure steam to drive the flue gas fan and boiler feed water pumps can be used. The steam is then condensed in the reboiler (Mimura et al., 1999). Furthermore, in power plants based on steam cycles more than 50% thermal energy in the steam cycle is disposed off in the steam condenser. If the steam cycle system and CO2 recovery can be integrated, part of the waste heat disposed by the steam condenser can be utilized for regeneration of the chemical solvent. The reduction of the energy penalty is, nevertheless, closely linked to the chosen solvent system. The IEA Greenhouse Programme (IEA GHG) has carried out performance assessments of power plants with post-combustion capture of CO2, taking into consideration the most recent improvements in postcombustion CO2 capture processes identified by technology licensors (IEA GHG, 2004). In this study, Mitsui Babcock Energy Ltd. and Alstom provided information on the use of a high efficiency, ultra-supercritical steam cycle (29 MPa, 600°C, 620°C reheat) boiler and steam turbine for a coal-fired power plant, while for the NGCC case, a combined cycle using a GE 9FA gas turbine was adopted. Fluor provided information on the Fluor Econamine + process based on MEA, and MHI provided information on KEPCO/MHI process based on the KS-1 solvent for CO2 capture. CO2 leaving these systems were compressed to a pressure of 11 MPa. The overall net power plant efficiencies with and without CO2 capture are shown in Figure 3.6, while Figure 3.7 shows the efficiency penalty for CO2 capture. Overall, results from this study show that the efficiency penalty for post-combustion capture in coal and gas fired plant is lower for KEPCO/MHTs CO2 absorption process. For the purpose of comparison, the performance of power plants with pre-combustion and oxy-fuel capture, based on the same standard set of plant design criteria are also shown in Figures 3.6 and 3.7.